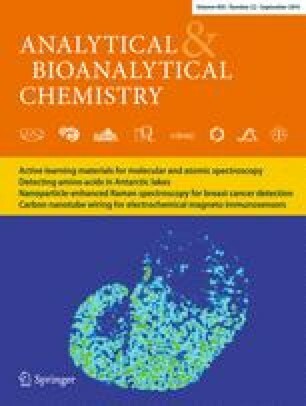 A thermoresponsive imprinted monolith with the ability of molecular recognition for ketoprofen was prepared for the first time. The smart monolith was synthesized in a stainless steel column using acrylamide (AAm) and 2-acrylamide-2-methyl propanesulfonic acid (AMPS) as functional monomers, which can form interpolymer complexation to restrict access of the analyte to the imprinted networks at low temperatures. To avoid a high back pressure of the column derived from neat dimethyl sulfoxide (DMSO) as a porogenic solvent that is needed to solve polar AMPS, an ionic liquid, [BMIM]BF4, was introduced into the pre-polymerization mixture. The molecular recognition ability towards ketoprofen of the resulting thermoresponsive molecularly imprinted polymer (MIP) monolith displayed significant dependence on temperature compared with a non-imprinted column (NIP), and the greatest imprinting factor was achieved at the transition temperature of 35 °C (above 10). Furthermore, the number of binding sites of the smart MIP monolith at 35 °C was about 76 times as large as that at 25 °C. In addition, Freundlich analyses indicated that the thermoresponsive MIP monolith had homogeneous affinity sites at both 25 and 35 °C with heterogeneity index 0.9251 and 0.9851, respectively. Xuan Sun and Chun-Yan Zhao contributed equally to this work. The online version of this article (doi: 10.1007/s00216-014-7932-3) contains supplementary material, which is available to authorized users. This work was supported by the National Natural Science Foundation of China (Grant No. 21375096).